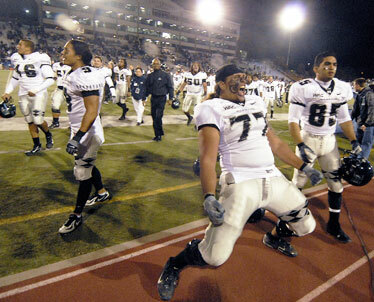 Hawaii offensive lineman Aaron Kia screamed after Hawaii defeated Nevada 28-26 Friday night on a last-minute field goal by Dan Kelly. RENO, Nev. » A half hour after the latest road thrill for Hawaii, a visit to the coaches' locker room at Mackay Stadium provided no clue to the outcome. June Jones spoke quietly on his cell phone. Wes Suan buried his head in the game stats, no emotion showing. Cal Lee nibbled on a postgame meal. A visitor shook his head and said, "Unbelievable," in reference to the Warriors' latest of three fourth-quarter comebacks to win road games. Lee pondered briefly, then slowly nodded his head. Then, with what seemed almost a sigh in his voice, he spoke. "Yes," said the architect of a 50-plus-game winning streak in high school. "Unbelievable might be a good word." If the Warriors coaches seem unimpressed by their 10-0 team's latest heroics, it's only because most of them have been in the profession so long that they know getting too riled up over extremes -- positive or negative -- is no good for continued longevity. But don't mistake placidity for lack of passion. Ask any of them and they'll tell you how proud they are of the players -- as well as each other -- following the 28-26 win over Nevada. Greg McMackin sat in the corner of the small room, eyes red, but happy. The defensive coordinator is always quick to compliment his position coaches and the players, but this time it seemed to mean more. Maybe it was because the Warriors had to contend with a stacked deck, as in just six days to prepare for the Wolf Pack compared to 13 for Chris Ault and his Nevada staff. It required some tinkering here and there, but McMackin's plan -- which had a little Jerry Glanville big-risk flavor to it -- worked. "We really put our corners on an island because we played a nine-man front. At the end, the important thing was get the offense back the ball. In the last 6 minutes we got them three possessions," McMackin said. "It's almost like San Jose State. They believed and they got the ball back three times. We were running man blitzes, filling up the box and two guys off the edge in case they ran bootleg. Our guys executed that perfectly." Tackle Keala Watson, who got more downs due to injuries to Mike Lafaele and Fale Laeli, came up big with a forced fumble and recovery. End David Veikune got Nevada quarterback Colin Kaepernick for a safety. And safety Desmond Thomas made a huge play, stopping Brandon Fragger on third down with barely 2 minutes left, no timeouts for UH and the ball in Hawaii territory. If Thomas doesn't make the play, the final drive doesn't happen. "We figured they were going to run the ball all night," Thomas said. BOISE, Idaho » Boise State can finally focus on Hawaii. For weeks, the No. 17 Broncos have been quizzed about looking beyond lesser opponents to next week's matchup with No. 13 Hawaii, a game that will decide the Western Athletic Conference championship. Boise State (10-1, 7-0) put itself in position to win its sixth straight WAC crown and maybe earn a second straight Bowl Championship Series bid by dismantling in-state rival Idaho 58-14 yesterday. "I'm not really going to think about it until tomorrow," Bronco safety Marty Tadman said of Friday's showdown with the undefeated Warriors in Honolulu. "I think I'll enjoy this victory today. I am really glad now we don't have to keep saying 'we're not overlooking anyone.' "
The Broncos broke open a close game in the second half, scoring 41 unanswered points after the Vandals cut the lead to 17-14 late in the first half. Taylor Tharp led the way, throwing for 282 yards and four touchdowns, including a 58-yarder in the third quarter to Titus Young that extended the lead to 38-14. Tharp was 22-for-31 before leaving early in the fourth quarter with the game well in hand. Ian Johnson carried 21 times for 109 yards and two scores and Austin Pettis had eight catches for 139 yards and three TDs. The Broncos rolled up 556 total yards, played their third straight game without a turnover and beat the Vandals for the ninth straight time. "We're definitely in a good situation in our season," Johnson said. The big, visible stories Friday were Dan Kelly's field goals (and Ault's timeouts) and Tyler Graunke putting up Brennan-esque numbers, while Colt played just two downs. Graunke completed 33 of 46 passes for 358 yards two touchdowns and no interceptions, but it wasn't enough for some fans. "Maybe it wasn't as sweet and pretty as everyone wanted it," Thomas said of Graunke's night that included three sacks and a lost fumble. "But he got the job done." Especially during the 2-minute drill to end the game. Graunke didn't try to get it all at one time, showing patience, taking 8 yards here, 12 yards there until the Warriors were in Kelly's range. That was hours after Brennan played for no apparent reason, but some very good underlying ones. It was a brilliant dual psychological ploy by Jones, designed to pump up his own team and keep the Nevadans guessing. "It was huge for us," Thomas said. "It made us think that he would lay his life on the line for us, go out there and give it his all. It really says something about our team." Jones said he made sure not to put his concussion-saddled star into harm's way, giving him two quick throws to Davone Bess to perform. "I just wanted him to get in and throw a couple of passes. I knew with those type passes he wasn't going to have to hold the ball and risk any injury," Jones said. "There was another one I was going to have him throw, but Tyler was in the game." Someone asked Jones about the hot topic of all last week, Brennan's medical clearance. "I have no idea if he was clear," Jones said. "I knew he wasn't going to get hit on those two passes." Brennan expects to play a much bigger role this Friday when the Warriors host Boise State with the WAC championship on the line. He wanted to play more Friday, but like the rest of the Warriors, he had a role to perform. His was decoy and inspiration. "I think now everyone sees how great this team, TEAM, really is," Brennan said. "Hopefully it'll help us out in the rankings. "I wanted to (keep playing), and when I threw that second pass I did not want to come out. But the thing is if I'd taken another shot I could've gotten another concussion. This was the game plan coming in and we executed it perfectly and it's an awesome feeling for this team right now." Today it is learned if the national perspective changes when a team comes up with a stirring road win with its superstar not in the game. All the Warriors know is if they believe it, it will happen. It has three times now. "It goes back to our leaders," Bess said. "As a whole, everyone is stepping up as one unit and we're playing with heart. When you know your role at the end of the day it pays off. We've had a great season so far, taking it back to LaTech and San Jose we just know not to give up. We've been in situations. We're so calm, collected and poised." Jones said he never doubted his team could do it again. "We knew we were going to get the ball one more time," he said. "These kids battle through all kinds of adversity. It's pretty powerful." The Setup: Hawaii 0, Nevada 0, around 14:00 remaining, first quarter, Hawaii ball, first and 10 at own 47. The Play: After Tyler Graunke starts and completes his first pass, Colt Brennan enters for the second play and throws a completion also, for a first down. Graunke then re-enters the game. SB Aaron Bain starts as Hawaii goes without a running back for the first series. The Impact: The mystery surrounding the Hawaii quarterback situation due to Brennan's concussion is only partially answered on the opening series, as even third-stringer Inoke Funaki takes two snaps. The drive ends with a 45-yard field goal by Dan Kelly. UH coach June Jones: "They had two weeks to practice. My intent was to run empty. So I just wanted to have (Nevada) think about it for a while." The Setup: Hawaii 3, Nevada 0, around 3:30 remaining, first quarter, Nevada ball, third and 10 at own 3. The Play: DE David Veikune bears down on QB Colin Kaepernick and sacks him in the end zone for a safety. The Impact: The Hawaii defense set the tone early, especially whenever Kaepernick wanted to pass. No one could know it when the play occurred, but the two points from the safety proved to be the difference in the game. Defensive coordinator Greg McMackin: "We were running man blitzes, filling up the box and two guys off the edge in case they ran bootleg. Our guys executed that perfectly." The Setup: Nevada 20, Hawaii 19, around 14:00 remaining, fourth quarter, Hawaii ball, second and 10 at Nevada 22. The Play: SB Ryan Grice-Mullins scores on a 22-yard touchdown pass from Graunke. Grice-Mullins is wide-open 7 yards past the line of scrimmage. Graunke throws him a perfect pass and Grice-Mullins speeds to the end zone. The Impact: Hawaii takes a 25-20 fourth-quarter lead (failed 2-pointer), but the drama is only beginning, as both teams turn the ball over once and the lead changes hands twice more. Graunke completes 33 of 46 passes for 358 yards and two touchdowns. He also ran for another. Graunke: "I've been watching from the shadow of Colt the past nine or 10 weeks. It's good to get a little spotlight." The Setup: Nevada 26, Hawaii 25, around 2:30 remaining, fourth quarter, Nevada ball, third and 4 at Hawaii 36. The Play: RB Brandon Fragger is given the ball up the middle. He is met immediately by S Desmond Thomas, who holds him to a 1-yard gain. It is Thomas' game-high 11th tackle. The Impact: Nevada punts and Hawaii takes over at its own 12 with 2:16 left. Graunke drives the team downfield in a well-executed 2-minute drill to set up Dan Kelly's winning field goal. Thomas: "I'm just going to fill that hole, and praise God, I made the play." The Setup: Nevada 26, Hawaii 25, 0:15 remaining, fourth quarter, Hawaii ball, fourth and 5 at Nevada 27. The Play: After a Nevada timeout, K Dan "Iceman" Kelly hooks a 45-yard kick a couple of feet inside the left upright for an apparent game-winning field goal. But Nevada had called another timeout right before the snap, and Kelly is forced to do it again. This time it is high and straight and true, and probably would've been good from as far as 60 yards. The Impact: Hawaii goes to 10-0 and finishes its road schedule with five wins and no losses, the best road record in program history. Two of the wins were in OT. Jones: "When he made the 49-yard kick at LaTech (to tie in the fourth quarter), I knew he had it inside of him." * -- Play No. 5 is this week's bloggers' choice. Readers of UH Sports Extra, the Star-Bulletin's Warrior football blog, vote for the biggest play of each game. UH football beat writer Dave Reardon selects the other four. Sacks (No.-Yds. ): Veikune 6-16, Noa 4.5-34, Kalilimoku 3-18, Purcell 3-18, Laeli 2.5-17, J.Leonard 2.5-10, A. Leonard 2-21, Fonoti 2-14, Elimimian 1.5-18, Lau 1-13, Patek 1-10, Soares 1-7, Newberry 1-7, Mouton 1-4, Maka 1-1, Lafaele 0.5-4, Savaiigaea 0.5-3. Total: 34-215. Interceptions (No.-Yds. ): A. Leonard 4-117, Newberry 4-98, Lewis 2-33, Monteilh 2-13, Davis 1-57, Mouton 1-40, Thomas 1-27, Jones 1-0, Patek 1-0. Total: 17-385. Fumbles (Forced-Recovered): J. Leonard 2-0, Patek 1-9, A. Leonard 1-0, Lewis 1-0, Lafaele 1-0, Watson 1-0, Newberry 1-(-5). Total: 8-4.